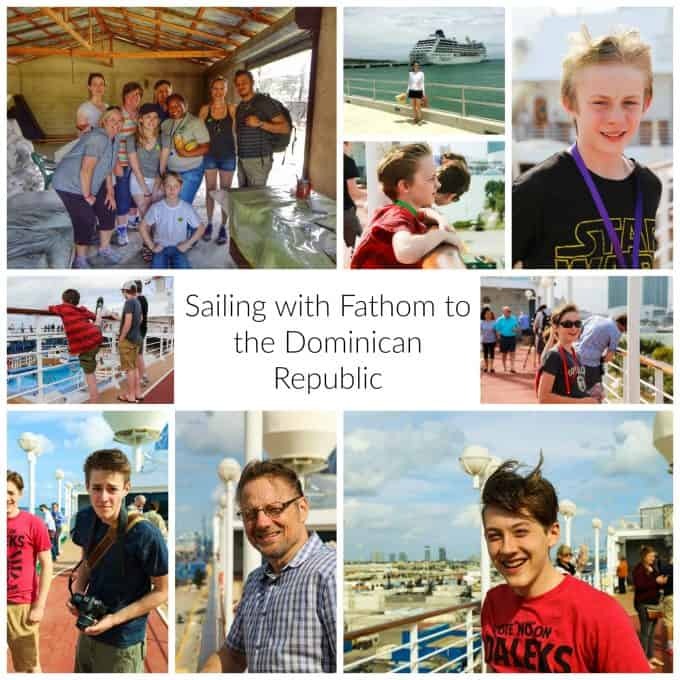 This post is the first in a series of posts that will be written by not just me, but also my husband and kids sharing our experience with Fathom: Impact Travel and our cruise on the Adonia to the Dominican Republic. We cruised courtesy of Fathom, but were not compensated for our time or these posts. The truth is that we would gladly pay for the experience and do, in fact, plan to sail with Fathom again as a family in the future. I can think of so many times these days when I feel like I’m on a wildly spinning merry-go-round and want to throw my feet to the ground to grind everything to an instant and jarring halt. We are a large family, so the level of activity is naturally going to be a little frenetic, but sometimes, well, it’s a bit much. We love what makes our schedules hop from our jobs, to kid activities (multiplied by 5 kids, that can be a pretty impressive looking schedule), to social obligations, family outings, and more but sometimes we just want to relax. When the chance to unplug for a week and sail with Fathom- Carnival Corporation’s newest brand- arose, we didn’t just say yes, we leapt. “Transformative” is the single best word I can think of to give the whole experience. 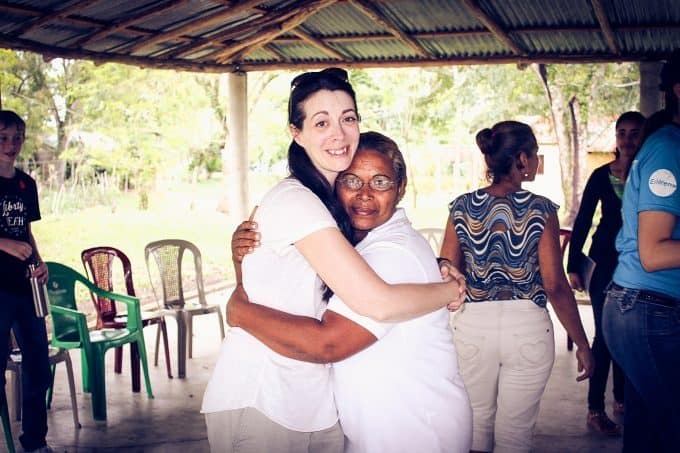 Tara Russell, the President of Fathom, said “It’s not easy to do something the world has never seen.” Maybe it wasn’t easy, but from the moment we stepped onto the Adonia, it was clear that Fathom is truly impact travel like the world has never seen. It was love in action. It was transformation embodied. At the beginning of the cruise, passengers were assigned to “cohort groups”. Cohort groups took classes together on everything from visual storytelling to English tutoring to Dominican history, and more. They also acted as sounding boards as we anticipated the on-ground activities and then -on the return journey- as we discussed the impact those activities had on us. Cohort groups gave us the added advantage of seeing others’ perspectives on the experience. Our family tried to choose our impact activities carefully so we would get a wide range of experiences to share when we returned. For the first day on the ground, we opted to do Community English Tutoring as a family. 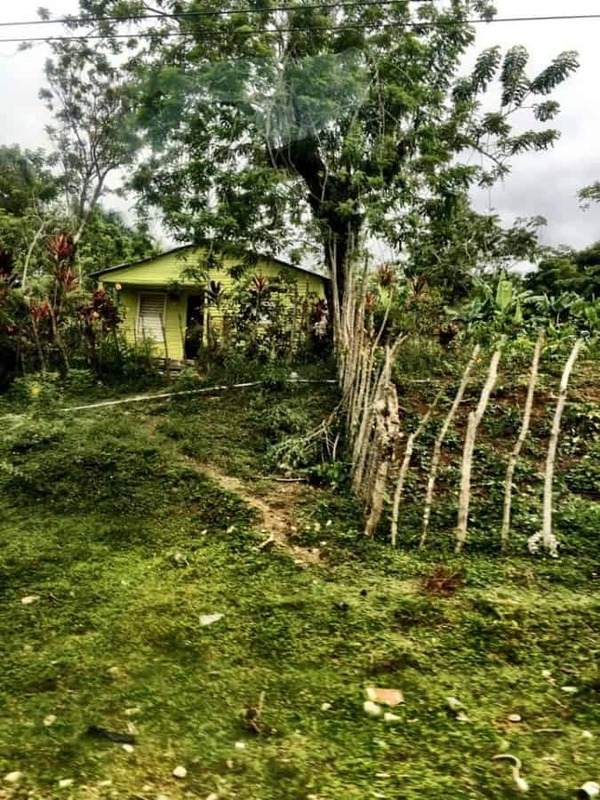 In this activity, we were bused to a remote Dominican village where an organization facilitated meeting and matching us with residents who then walked us to their homes. 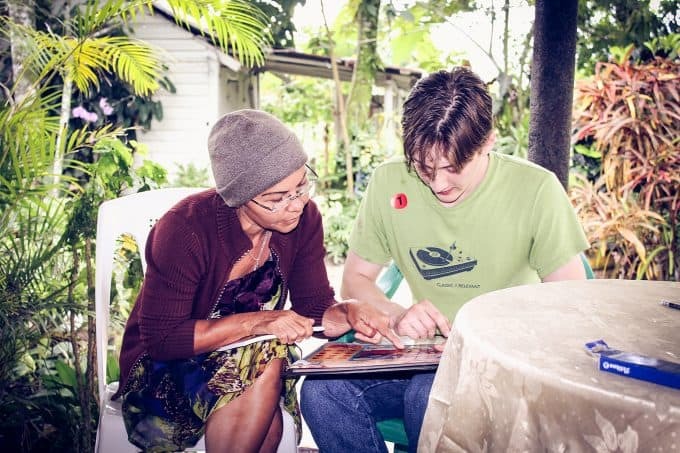 In the homes, we tutored them in conversational English. In short, we chatted. Because so much of the Dominican economy is tourism based, and so many of the tourists speak English, being conversant in English is a prerequisite for many jobs. The time we spent with them simply chatting and using the tutorial materials provided could set them on the road to materially improving their circumstances. That alone was amazing. I want to talk to you about a parent’s perspective, though. Our Impact Guide, Michelle, had assured us all, “Don’t feel under-qualified! Speaking English is all you need to be successful in this.” I admit I wondered a bit, though, how useful two adults and five kids could be in that short time. I needn’t have worried. I watched all of my kids interacting with adults and kids they had never met. The only skill they needed aside from their clear ability to speak English was the willingness to help people try to learn what they knew. I watched my kids’ faces as they burst through the borders of their comfort zone to help an adult learn to say “Hello. My name is…” and then cheer with the adult when they nailed it. Then when they’d covered the requested materials and the adults helped my kids learn to say the equivalent phrase in Spanish? Let me tell you something. You haven’t lived until you’ve seen your kids help people and then have it dawn on them that they themselves have learned something in the process. When the tutoring session was over, we walked back from the participants’ homes to the community center all together. One of the matriarchs hooked her arm through mine and leaned on me as we walked. I pointed at the signs we passed and tried to understand some of them. We laughed hysterically when we realized I had NO idea what the signs said or what she was telling me, but she patted my arm and smiled at me indulgently. At the community center, translators helped us freely discuss the experience with each other. My 16 year old son was bear-hugged by Doris, one of the residents, who then pulled back, made the sign of the cross over his heart and blessed him, and then pulled him down to kiss his cheek. My son beamed. My 10, 12, and 14 year olds cheered and fist-bumped ladies who said, “It’s nice to meet you! How are you today?” The ladies kept delivering hugs to my boys or rumpling their hair and saying “que lindo!” I felt love from the residents toward my boys. I knew it was a term of endearment without even speaking Spanish. 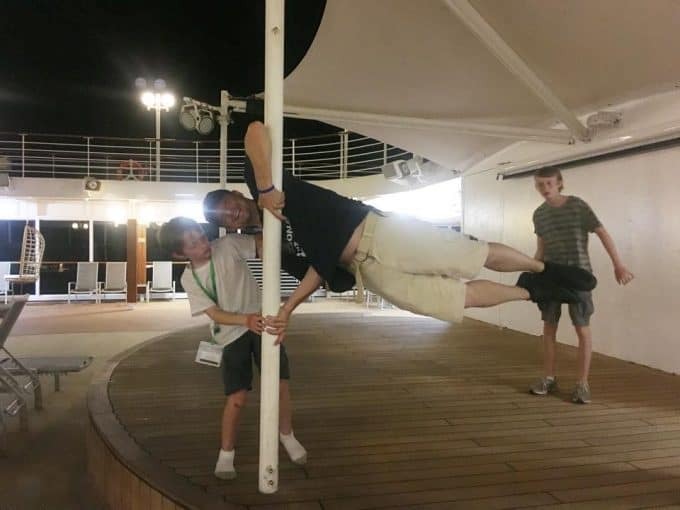 My 18 year old had a facebook friend request from one of the ladies he had tutored by the time we got back to the ship. She left him a message on his wall saying, “the 19th of April will be forgotten, I will never forget your presence in our lives, you’re a special kid. Really. We love you so much, kisses…….” We are talking about everyone being transformed. Love in action. The next day, we split up. My husband took the four eldest boys to do a reforestation project, and I will let him tell the story in his own words in another post. 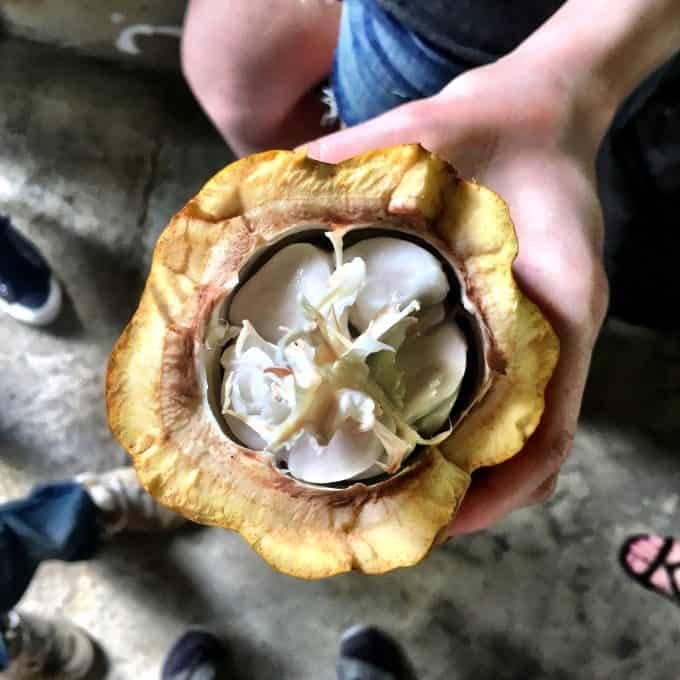 The youngest and I, however, joined forces and helped make chocolate at a women’s cacao cooperative called “Chocal”. As we learned the history of the cooperative, I was grateful for so much. I was thankful that in my life, I had never had to leave my home for weeks at a time trusting my kids’ well-being to kind neighbors just so I could earn enough money to make ends meet. I was thrilled that these women had used their ingenuity to find a solution to this challenge by engaging local cacao farmers and opening their own factory that yielded products that are now widely sold in the Dominican Republic. When we met the CEO of the women’s cooperative and she explained that she had quit school at a young age because she started having babies, then felt inspired by her work at the cooperative not only to finish her high school degree, but to go on to get her Bachelor’s Degree, and was currently working on her Master’s of Business Administration, I was blown away. These women were now able to have their families live right next to where they worked, provide an income for them, and go on to hire their own kids to help THEM provide in turn for their own young families. 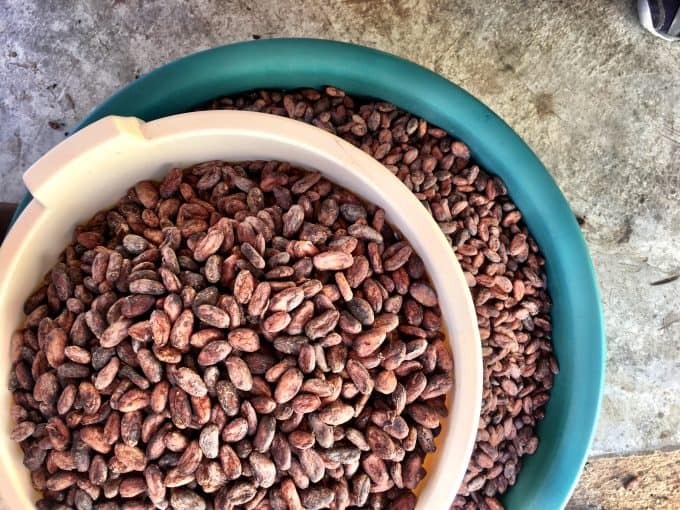 We helped sort cacao beans, sift roasted cacao, and package candy bars for sale. Through the whole time at Chocal, we laughed, we learned about their goals, we enjoyed our new friends, we worked with Fathom passengers from all over the world. They said we helped increase their productivity for the day, increasing their earning power. Did we? I sure hope so. I know, though, that I will never take another chocolate bar for granted again. Love in action. Transformation. Yes, we were there to get to know the Dominican people and culture and make a difference, but make no mistake, WE came away changed. For our final half-day in port, we decided to wing it. 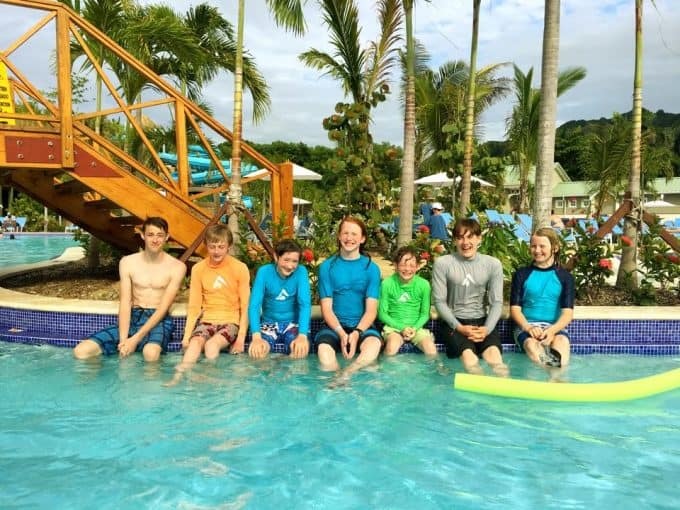 We lazed about by the lazy river pool at Amber Cove with some new friends our family had made on the ship, the kids indulged in an unlimited zipline package, and my husband and I sipped some seriously amazing iced coffee from the Cafè el Cibao in the shopping area. 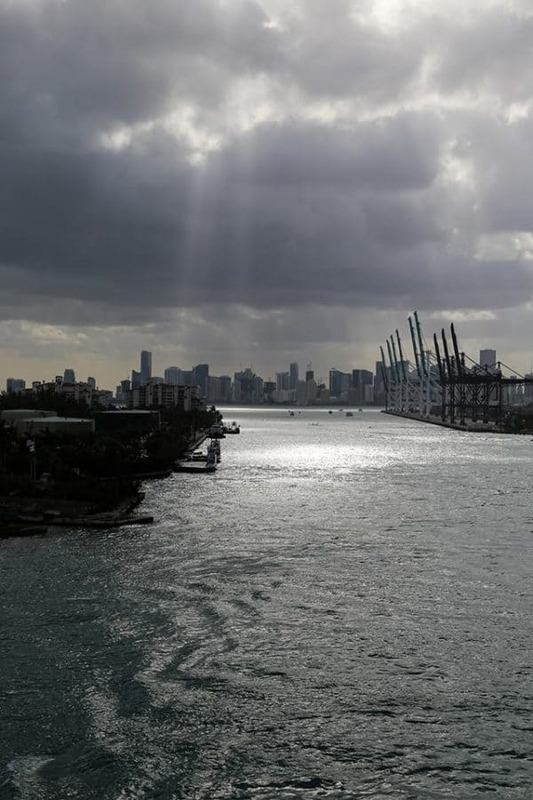 As our family strolled back down the pier to return to the ship as it prepared to turn back toward Miami, we were all in agreement that although we had spent nearly 3 full days in port, we were in no hurry to leave. The colours, sights, sounds, smells, and -above all- the people of the Dominican Republic had captured us. My husband and I admitted that we had eyeballed the realty signs for homes for sale and had wild fantasies of chucking it all and moving to the DR. I would be remiss if I didn’t mention the shipboard life on the Adonia, though. This is another area where Fathom sets itself apart from the ‘normal’ cruise experience. I’ve never been on another cruise where the staff mixes so comfortably with the passengers. It was normal to see staffers eating lunch in the buffet area while passengers ate. My kids played ping pong with other passengers, to be sure, but they also played with Impact Guides and crew. If you’ve cruised a time or two, you know how refreshingly unusual this is. There isn’t the third wall between the cruise ship staff and passengers that exists in so many other cruises. At the same time, the staff is professional, knowledgeable, and more than willing to do anything it takes to make your time with Fathom extraordinary. Love in action. Transformation. Here’s the deal: if you have ever traveled and just wished for a deeper knowledge of where you are, Fathom is for you. If you’ve ever wanted to wander beyond the shopping area of a port and get to see the real sites, Fathom is for you. If you have ever wanted to watch your kids bloom in front of your eyes, Fathom is for you. If you’re a grandparent and want to find a way to work alongside and get to know your grandkids, Fathom is for you. If you’ve ever wanted to do something extraordinary with your parents or siblings, Fathom is for you. If you’ve ever wanted to go on a missions trip or service trip and not known where to start, Fathom is for you. If you have ever desired a deep connection with strangers based on your mutual willingness to learn from each other, Fathom is for you. Above all, if you want love in action and transformation, Fathom is exactly what you’ve been looking for all this time without even knowing it. You’re very welcome, Judy! We were blown away by the impact this had on every one of us. Even now in July, my kids talk about it on a daily basis. Oh Friend… I got all welled up looking at those photos and reading about your experience. What a wonderful trip and such a blessing to have that time with the family. I am not a typical traveler, as I tend to avoid “touristy” places like the plague. I want to EXPERIENCE a place and that sounds like what you were able to do! I love this so much! You and me both. I mean, there are only so many little trinkets emblazoned with the flag of the nation you’re visiting you can tastefully fit into a home. I don’t go to a place to shop (but DANGIT, I’m okay with shopping where the residents shop! ), I go to a place to get to know the people and learn about the culture. Fathom is the first and only cruise I’ve ever been on to make this not just a benefit but the focus. You guys would love this. I do advise going! Thanks, Kita! It is such a unique model for a business and one that I admire deeply.